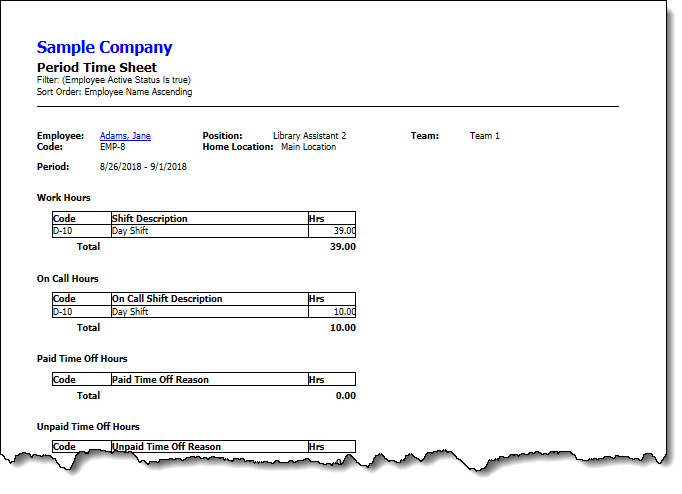 The Employee Period Time Sheet report shows the scheduled work hours, on-call hours, paid and un-paid time off hours in any user-selectable time period for each employee. The Document Map shows the tree view of the employees covered in the report. Clicking any of the employees will position the report to the section that shows the time sheet for that employee on a single page. Note: Optionally, you can include a signature line at the bottom of the page for the employee to sign and date. Report Header Information: Your business name, report title, the range of dates covered in the report, and the sort order. You can selectively hide these fields using the  command. Employee Header Information: Information about the employee. Each header contains the employee name, employee code, job position, team, and the employee's home location. Clicking the employee name hyperlink will bring up the Employee's record to let you view and make changes if needed. Work Hours: This section shows the daily hours for each shift the employee is scheduled to work in the reporting period. On Call Hours: This section shows the daily hours for each shift the employee is scheduled to be on call in the reporting period. Paid Time Off Hours: This section shows the daily hours for each paid time off reason the employee is scheduled to be off work in the reporting period. Unpaid Time Off Hours: This section shows the daily hours for each unpaid time off reason the employee is scheduled to be off work in the reporting period.